Laton, CA Holder brothers tour NRI Project site in Five Points, CA! Brady and his brother, Riley Holder, farmers in Laton, CA in California's San Joaquin Valley, came out to Five Points where they visited the NRI Project fields as part of CASI's Friday soil tour program and they also sat down with CASI's Jeff Mitchell to plan their application for a project with CDFA's Healthy Soils Program (HSP). 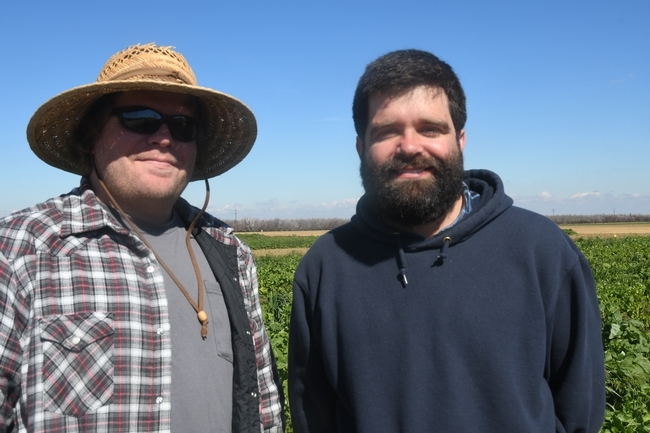 The two brothers are hoping to submit a project proposal to CDFA for the state agency's new round of Healthy Soils Program projects. In their application, they hope to receive funding from the HSP to enable them to set up a farm demonstration of cover cropping in their farm's corn and alfalfa rotation fields. They discussed details of their application with Mitchell and intend to prepare the final aspects of their proposal during the coming two weeks.